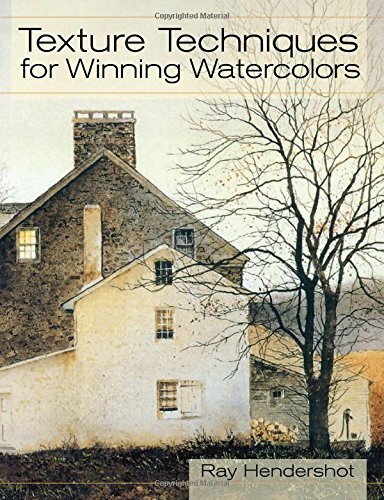 Texture Techniques for Winning Watercolors is a book for intermediate and advanced watercolour artists who want to take their texture techniques to the next level. The artist and author Ray Hendershot's style is geared more towards realism rather than the stylised watercolour art based on shapes. However, it's not about photo-realism. You can still feel the full flavour of a watercolour painting. There are 21 step-by-step exercises with real paintings as examples, as well as five demonstrations. For the exercises, you can easily follow with the instructions, although it will take a lot of practice to get to the level of finesse shown by Hendershot with his paintings. The best thing is you now know what's possible with watercolour. The exercises cover subjects like trees, weathered wood, worn surfaces, bricks, grounds and landscapes. The examples look amazing in terms of detail. You won't be reproducing the exact paintings, but merely practice the techniques used to create effects. One downside of the book is the colour reproduction. Most of the paintings look as if they were painted in the era where the Old Masters lived. The colours are very subdued, with lots of browns and blacks, which could be due to the nature of the subject being drawn. It will really be interesting and fun to see these watercolour texture techniques being replicated with more vibrant pigments. With this book you can do just that. Overall, it's an incredibly informative book with great exercises and instructions.